The Grass Wood Co. Ltd. The Grass Wood Co. are the official UK and European distributor for hand crafted bamboo cases for the MacBook Pro, MacBook Air and iPad. They approached Red Ghost Creative to create a vectorised version of a logo idea they had mocked up, which we did. they now have full control of their logo, no matter what size they wish to scale it to. 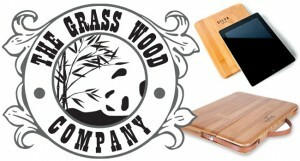 Why not visit The Grass Wood Co. website and look over these beautiful cases designed to protect your precious apple product.